What are the connections between sounds and abstract images? What were the first audiovisual instruments? How did music influence Kandinsky’s work? What are the most significant audiovisual installations? What relationship is there between VJs and live cinema? And finally, what is synesthesia? 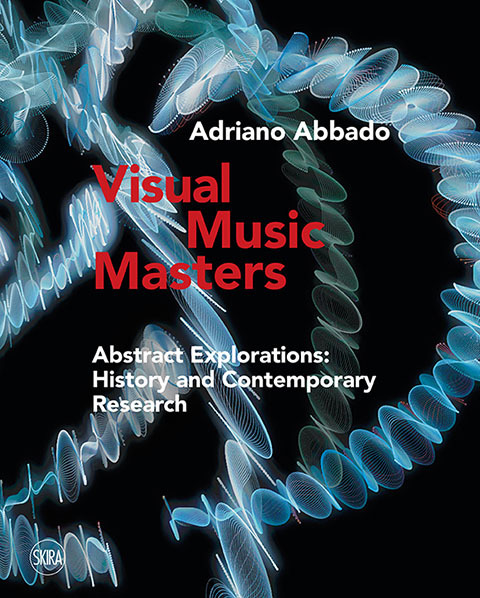 Visual Music Masters thoroughly explores past and present research to answer these and many other questions about the relationship between music and abstract art. Covering figures that range from Toulouse-Lautrec to Nam June Paik, from Händel to Xenakis, and from Fischinger to Ikeda, this book illustrates the stages by which the artistic community has embraced the latest technologies and a multi-sensory universe, creating in the process an independent form of expression: visual music. Buy Visual Music Masters from Skira or from Amazon Australia, Brazil, Canada, China, France, Germany, India, Japan, Mexico, Spain, Turkey, UK or USA. Review: The Visual Music Blog. Arshake. Quali legami esistono fra i suoni e le immagini astratte? Quali furono i primi strumenti audiovisivi? Quale l’influenza della musica su Kandinskij? Quali sono le installazioni audiovisive di maggiore rilievo? Quali sono i rapporti tra VJ e live cinema? E infine, cosa è la sinestesia? I maestri della Visual Music è uno studio approfondito, suddiviso in esperienza storica e ricerca attuale, per rispondere a questi e molti altri quesiti riguardanti la relazione tra arte astratta e musica. Spaziando da Toulouse-Lautrec a Nam June Paik, da Händel a Xenakis e da Fischinger a Ikeda, sono illustrate le tappe che hanno portato l’ambiente artistico a confrontarsi con l’universo multisensoriale e la tecnologia contemporanea, così da arrivare a una forma espressiva indipendente: la Visual Music. Acquista I maestri della Visual Music da Skira o da Amazon. Spacelife 1 is the first 3D world of a series meant to be seen with a Samsung Gear VR, Oculus Go or compatible devices. The user can fly through the world at two different speeds, stop and look around. This video is a short excerpt of the VR experience. This entry was posted on Tuesday, May 9th, 2017 at 9:38 am	and is filed under Art. You can follow any responses to this entry through the RSS 2.0 feed. Both comments and pings are currently closed.